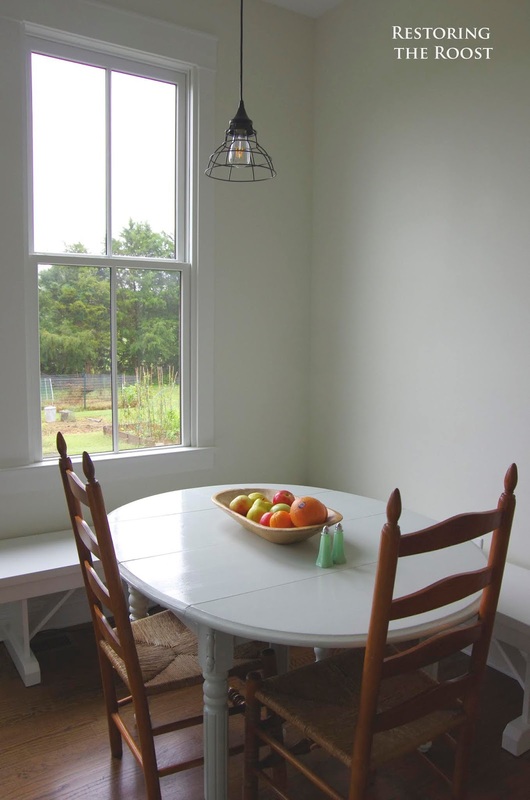 Welcome to our simple farmhouse kitchen! Of all the rooms in our new house this is probably my favorite next to our master bathroom and screened in porch. 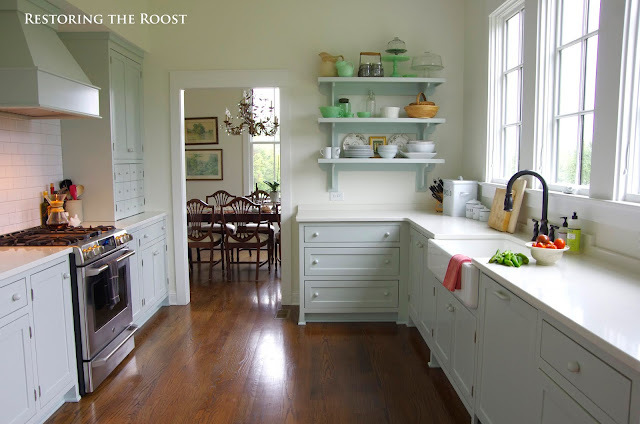 There are so many things we deliberately did or did not do for this kitchen to not only save on costs to be able to afford the quality we wanted, but also to achieve a Shaker-inspired, "farmhouse" look for our new farmhouse on our budding homestead. FYI--this is not how our kitchen normally looks :) I've cleared off all the clutter so that you'd be able to see the details of everything. 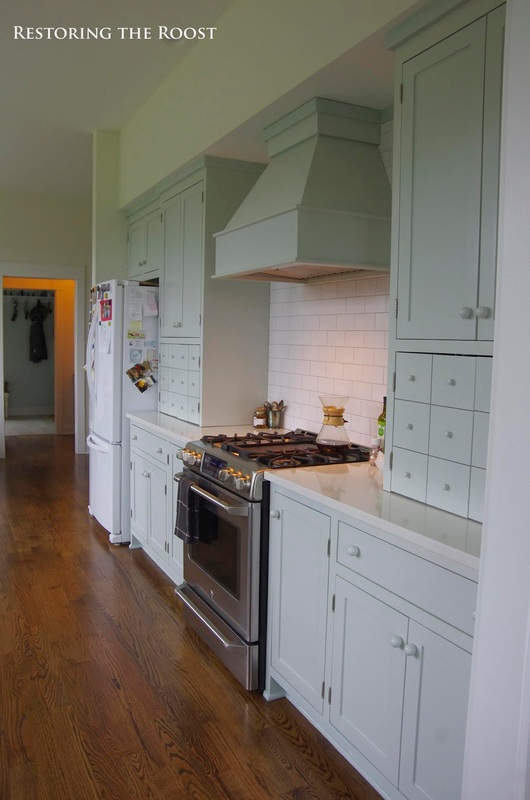 The overall layout of the kitchen is a large, open, plan with no island. I wanted traffic to be uninhibited and to me, an island always makes it hard for folks to get through when there are a lot of people in the kitchen at once. Although we don't have as much counter space without an island, we use our kitchen table for a lot of what we would be using an island for. 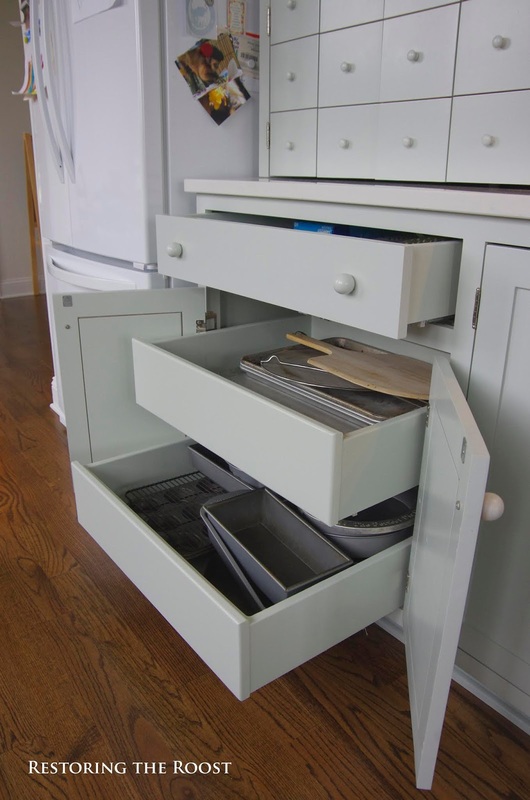 We still have plenty of counter space for prepping, baking, and general day-to-day use. Our cabinets are a Shaker style painted in Sherwin Williams "Sea Salt," with a simple Shaker panel inset door. 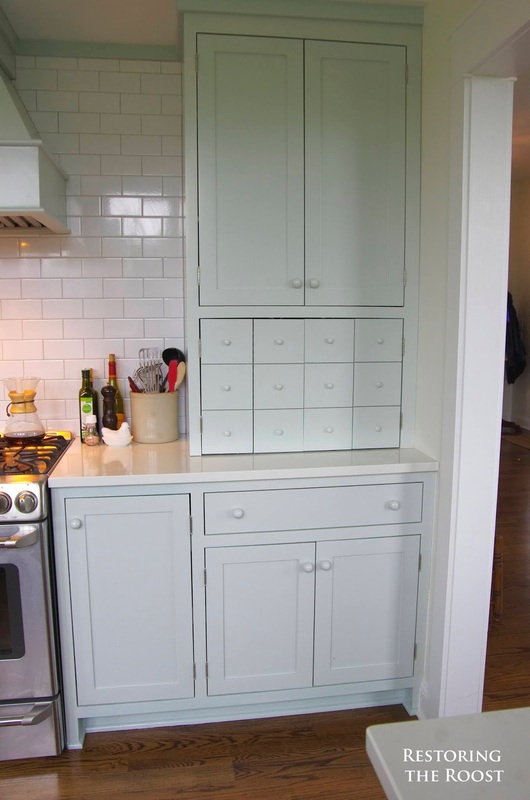 The color is a cross between a light grey, light green, and light blue and looks different in all kinds of light. I like that it is neutral but not white and adds some contrast to our white quartz countertops. 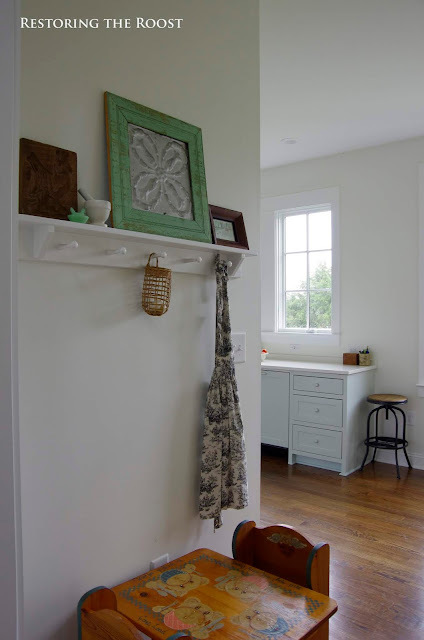 The floors throughout most of the downstairs except for bedrooms are a standard oak hardwood, stained in Dark Walnut. 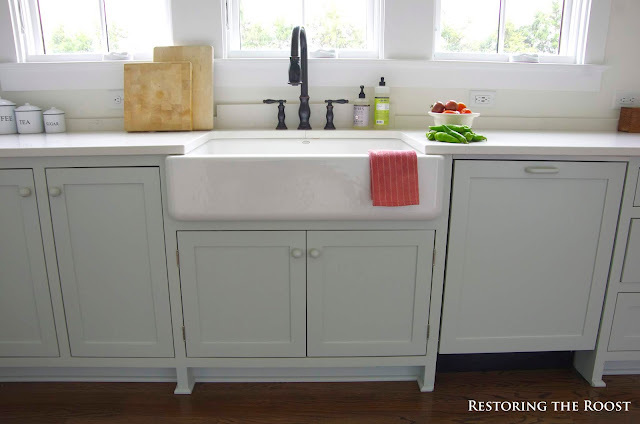 We chose a Kohler cast-iron farmhouse sink that I absolutely adore. It is so deep and large to hold our biggest pots and pans for washing. 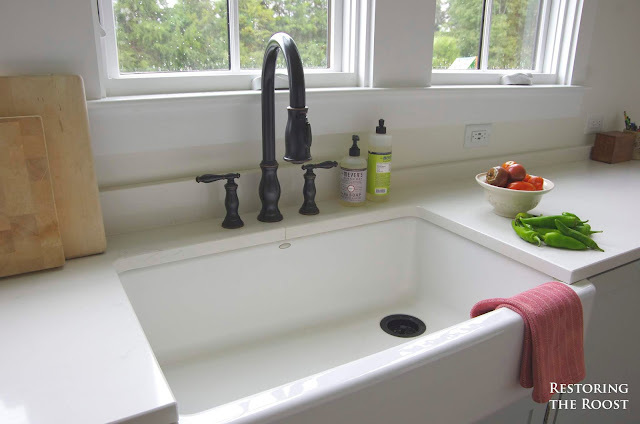 An oil-rubbed bronze faucet that I won in a blog giveaway works beautifully. The three windows above the sink are casements and can be opened all the way--I just love having the fresh air and being able to look out over the garden while I cook and do dishes. The dishwasher is a Bosch with a wood panel placed on it to match our cabinets. I really wanted this feature since we were going for a farmhouse kitchen instead of a stainless version. 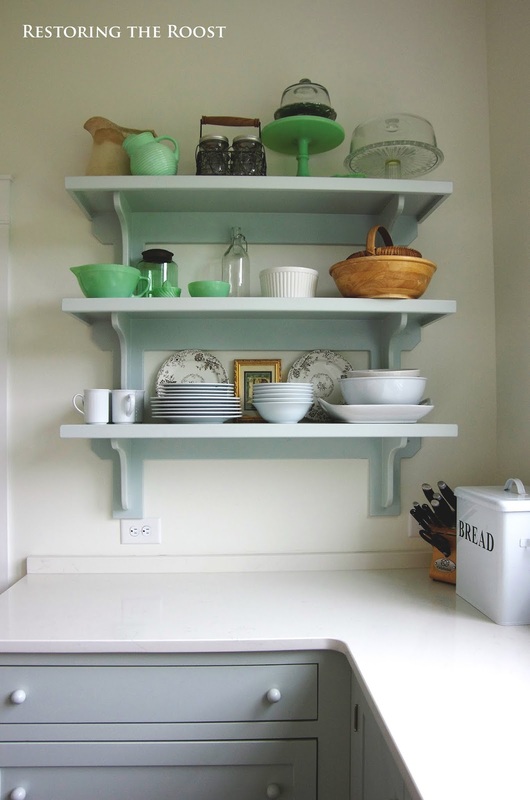 Our builder made some open shelves for us that hold a lot of everyday dishes and serving pieces for us. 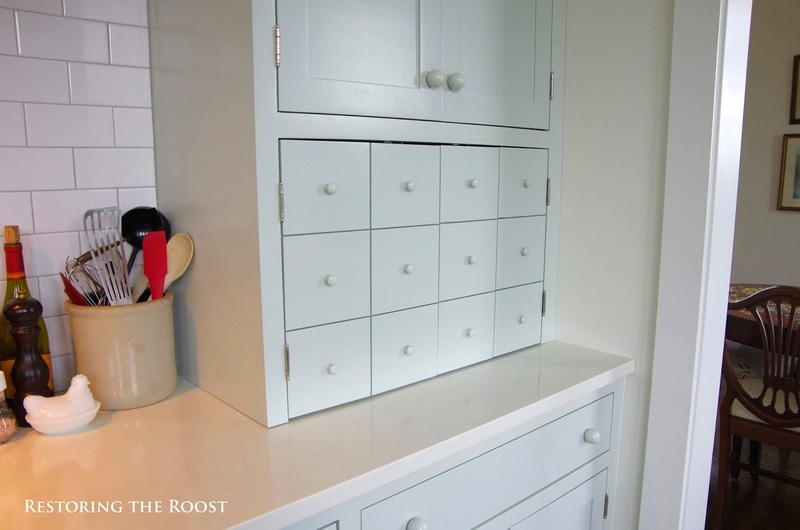 We opted to do very minimal upper cabinets (only on one side) and it saved quite a bit on costs. All the cabinets on the bottom are either drawers or cabinets that open up with pull-out drawers, even the smaller ones. The stove is a GE Cafe slide-in range with four burners and a grill in the middle that can be converted into an additional two burners if needed. 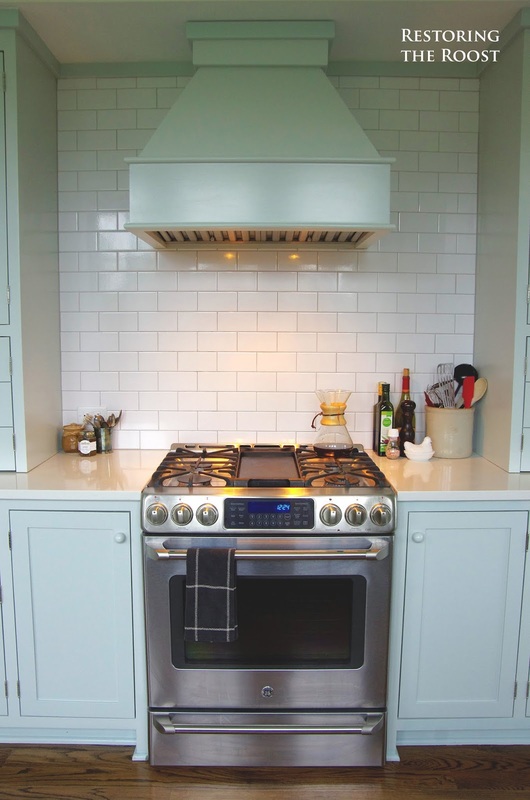 The lower oven drawer also functions as a double-oven where temperature can be adjusted like a normal oven. 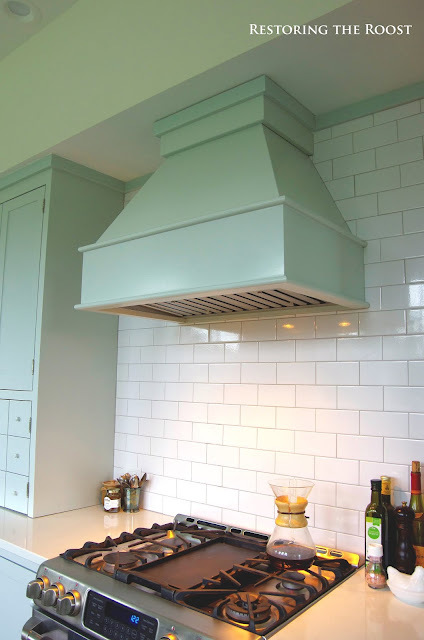 We chose a very simple, white subway tile backsplash above the stove and our builders crafted a stove hood that matches the look of our trim and cabinetry throughout the house. 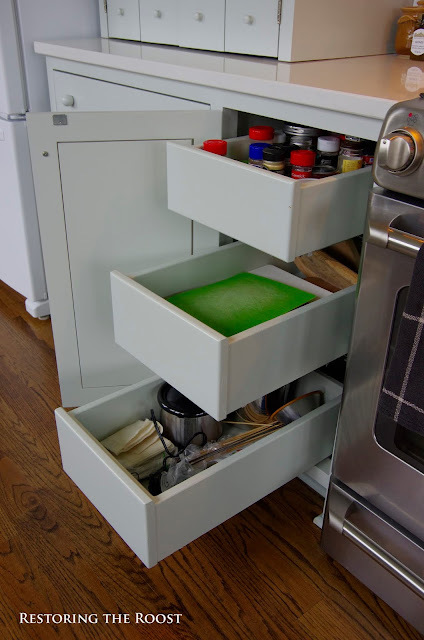 One cool little feature that my husband requested are these two appliance garages below each of our large upper cabinets that have the look of small Shaker drawers when closed. 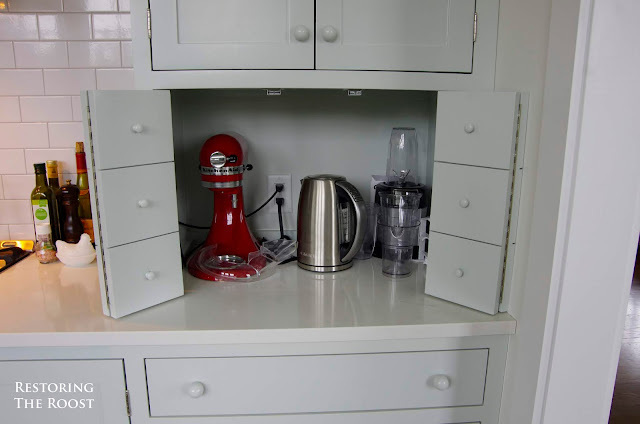 When opened, they hold all our small appliances on the counter that can remain plugged in. 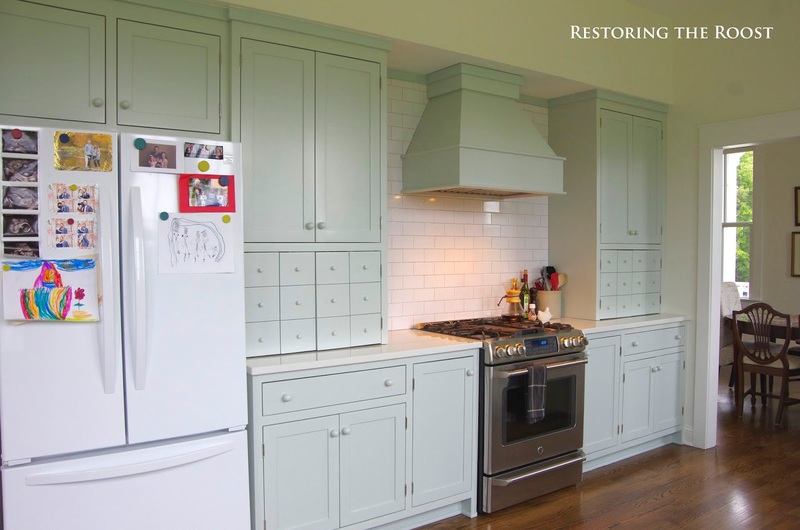 We reused our refrigerator from our old house as well as our old kitchen table--except we painted the table "Sea Salt" to match the cabinets. 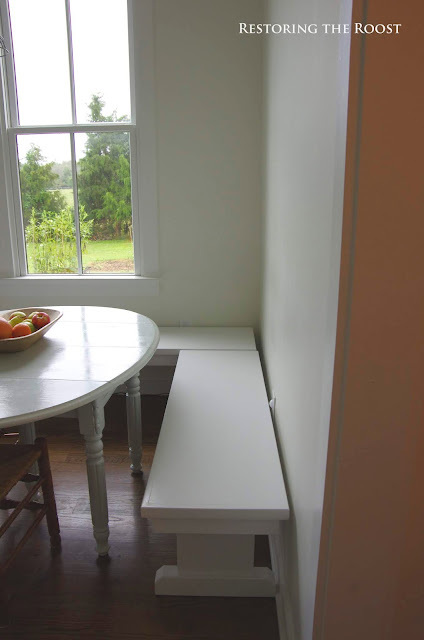 Our builders constructed these movable benches for us that create a little banquet seat by the windows around our table and they are perfect for cleaning up after small children. 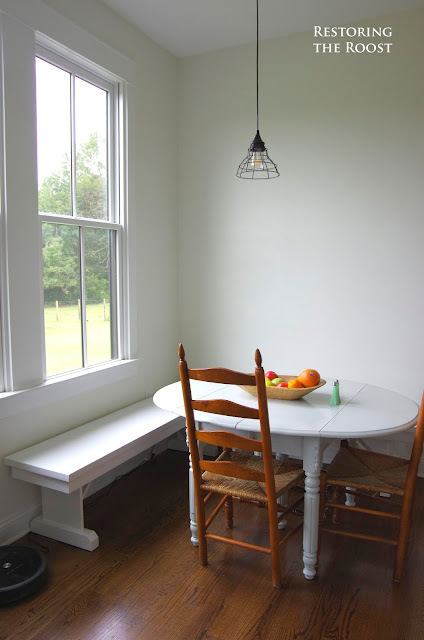 Overtop of the table is a $20 pendant light fixture we bought from Lowes. The rest of the lighting in the kitchen is recessed in the ceiling. 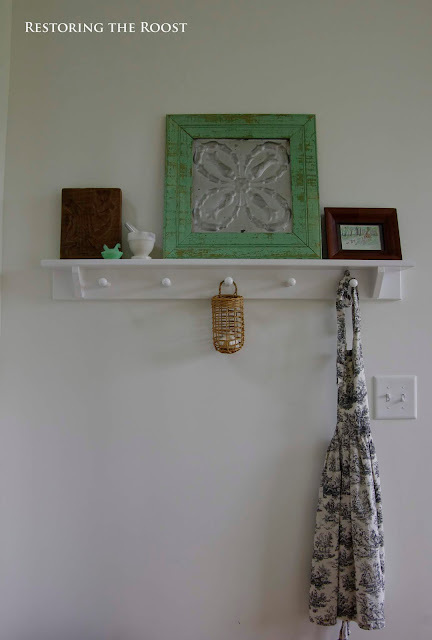 We will eventually figure out some type of artwork to hang on this wall above our table...yet another project to complete at a later time. 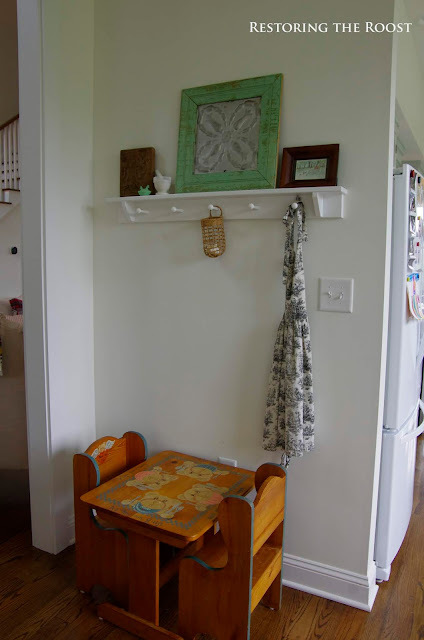 We use the small space entering the kitchen from the living room to hold a little table and chairs for the girls that was made for me when I was little :) Above it is a Shaker-peg wall shelf that we had our builders make for us to hang things like aprons, dried herbs, etc. and display some of our collectibles. Very pretty and well to clean without the island and your drawers are perfect too.ught out kitchen. 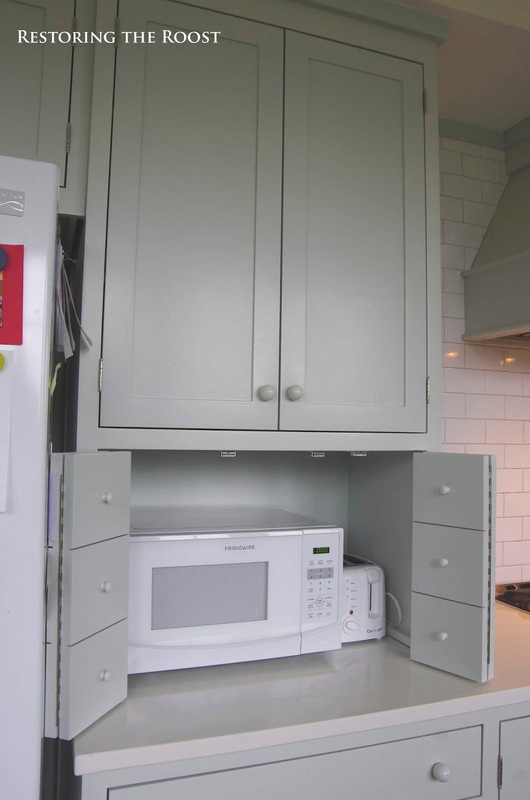 I love how neat it is and I know you took everything off the counters. I mean, the style is neat and the drawers are perfectly stored with your utensils and everything for your kitchen. We remodeled ours about 7 years ago and I still love it, cause like you we planned it perfectly for us. 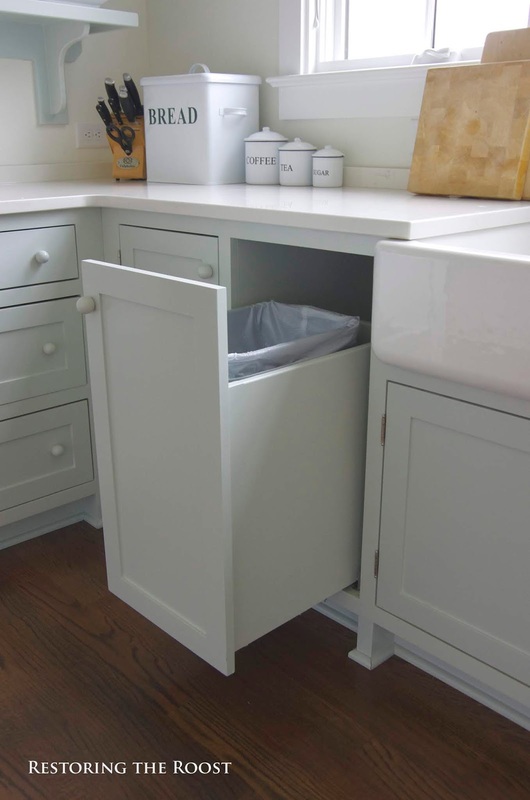 (My computer is skipping) I meant: Well thought out kitchen and so neat and clean to perfection ! 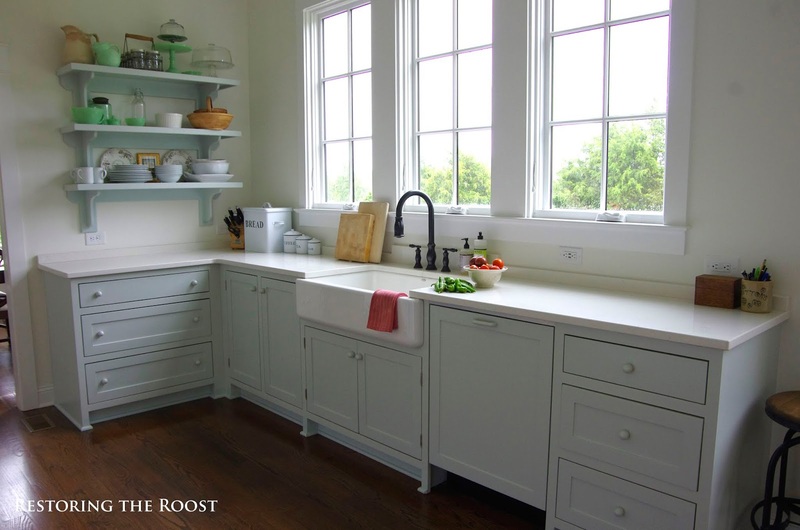 I have been out of town hope you get this, i love your kitchen, it is so very perfect, cozy and wonderful. 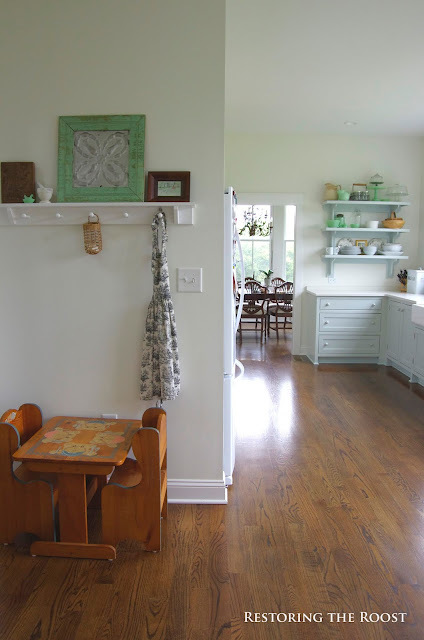 All of it, color, drawers, open shelves, little childhood table, know you and your family will enjoy making wonderful memories here.